17/2/12 - Acquisitions - Reims, Musée des Beaux-Arts and Paris, Musée d’Orsay - The Musée de Beaux-Arts in Reims which wished to acquire the furniture for Henry Vasnier’s dining room, auctioned at Sotheby’s yesterday on Saturday, 16 February (see news item of 7/1/13 and that of 15/2/13), was only partly successful in its attempt. Like the glass seen by an optimist as half full, and a pessimist as half empty, we should thus be happy that this museum in Champagne managed to keep here in France the dining room table Herbes potagères [Herbs from a vegetable garden] (ill. 1), the console Soir d’avril au vignoble [April evening in the vineyard] (ill. 2) and a pair of chairs (ill. 3) or else regret the fact that this ensemble is dispersed even further afield than before with the loss of the magnificent buffet, Les Chemins d’Automne [Autumn paths]. 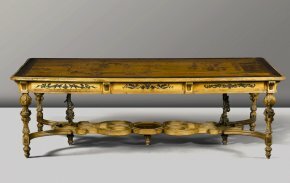 This furniture, corresponding to lots 12, 13 and 17 was acquired before the auction for an undisclosed sum, nor do we know the name of the patron who probably enabled the museum to make the purchase. We hope the buffet, and the twelve other chairs may one day be reunited with the rest of the dining room now in Reims. 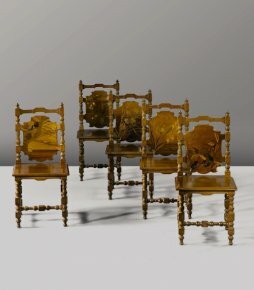 In another acquisition, the Musée d’Orsay pre-empted a pair of candelabrum on pedestals by Georges Hoentschel (ill. 4), for 120,750€ (charges included). These particularly elaborate objects are each made up of a "stoneware vase in baluster shape on a pedestal holding a floral composition in gilt bronze with five lights, the sides of the vase adorned with masks of satyrs, on an elm stand sculpted with branches, fixed on a painted wood base." They were presented at the Exposition Universelle of 1900 and have a prestigious provenance as they were acquired by the Countess of Ganay to decorate her Parisian bathroom.